Healthy Hemp CannaNatural™ 4oz. | Castleton Pet Supply, Inc. 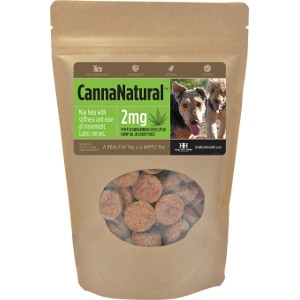 Healthy Hemp Pet CannaNatural™ are a dosage form health product optimized for joint support and infused with non-psychoactive phytocannabinoid-rich hemp oil extracted in Colorado from Colorado grown and harvested industrial hemp. Nurture your pups’ desire to be active. It’s the only hemp health product for companion animals guaranteed to contain 2 mg. of phytocannabinoid-rich hemp oil in every single piece. May help with occasional stiffness, ease movement and calm nerves. Contains only natural, gluten-free, non-GMO ingredients. Made in a U.S. facility dedicated to pet products by an industry-leading manufacturer that has never been part of any recall throughout their 20-years of making premium-grade products for pets.